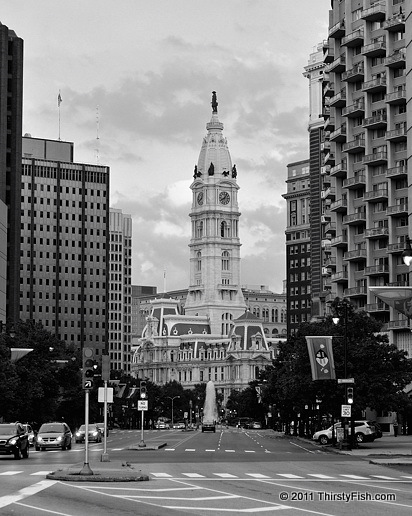 The building that you see in the focal point of the photograph is the Philadelphia City Hall and the statue that stands on top of it is of William Penn, the founder of Pennsylvania. Until 1987, it was the tallest building in Philadelphia due to the terms of a gentlemen's agreement that forbade any structure from rising above the William Penn statue. It should have stayed that way. It seems that many of the influential people that contributed to the foundation of the United States were philosophers. They were remarkable men with an accurate understanding of the problems of the Old World; Problems they tried to avoid in the establishment of the New World. William Penn converted to become a Quaker at the age of 22 and experienced persecution because of it. When he founded Pennsylvania, he instituted measures to make sure that his colony would be a place where anyone could worship freely. He established minority rights with the vision that "all men are equal under God". He set out to lay the legal framework for an ethical society where power was "derived from the people". While limiting his own power, he established a government with two houses to safeguard the rights of private property and free enterprise, and impose taxes fairly. He stripped the injustices of the British Penal System and replaced it with a progressive one. He expanded on the ideas he borrowed from John Locke and attempted to create a "Framework of Government" with an amendable constitution to ensure that the government could keep up with the changing times by accommodating new ideas and dissent. Although he had limited success in his lifetime, his ideas were later studied and expanded by the likes of Benjamin Franklin, Thomas Paine and Thomas Jefferson in the founding of the United States. Given that the United States is shifting from its progressive beginnings to the Old World ideas of centralized power and imperialism, albeit under a different disguise (neocolonialism, corporate power), there is an immediate demand for active philosophers like those that founded the nation.